Everything about Southern Accent exceeded my expectations- from our friendly, knowledgable server, to the unique and atmospheric decor, to the on-point food. We were seated in a draped closet with a curtain to close for privacy : simultaneously strange and wonderful, kind of like the whole place in general. There were some serious voodoo vibrations in the air- they even have an in-house psychic. Our waitress was amazing- super energetic and helpful without being overbearing. My partner and I both had the prix fixe menu at $25 a piece. We started the meal with a good cocktail and some serviceable Shiraz Cono Sur ($8 glass). For the appetizers, my green salad was delightful and perfectly dressed, while the Alligator meatball had good flavour. My entree was absolutely fantastic- simple but perfectly executed: a white fish with buttery rice and blistered bok choy. My companion had the chicken with lemon sugar beurre and a side of jambalaya and seared collard greens. The desserts were okay. The bread pudding with bourbon sauce was a bit dry and while the apple pie filling was great, the crust left something to be desired. 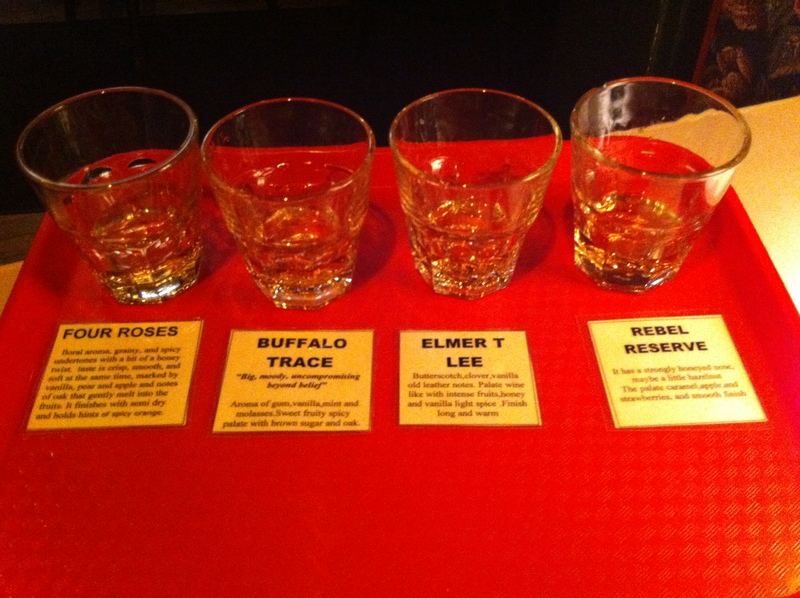 However, we didn’t notice so much since we were busy sampling our Bourbon Flight (four different kinds of bourbon that came complete with tasting notes)- a fun activity for date night. Overall, we had a great night out and would definitely return for the solid food and the undeniable atmosphere. This entry was posted in Cajun/Creole, Recommended, Uncategorized and tagged corn bread, hush puppies, jambalaya. Bookmark the permalink.